Try something new – yet old – the traditional Chinese instrumental music. Ancient Chinese have left a wealth of music instruments and classic tunes. Erhu, Guzheng, Guqin, Xun, Pipa, and other traditional Chinese music instruments may alter your acquired definition of "music". The great works that have been playing for hundreds or thousands of years may also echo in you. We keep updating. Remember to bookmark us and Come back for more! 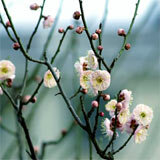 Top quality CDs of traditional Chinese instrumental music are also available on Sinohits now. Here are some of the most famous melodies from the Middle Kingdom. Each piece of the music has a story behind it, and thus forming a specific aesthetic and spiritual enjoyment. Begin this journey and immerse yourself in the unique charm of traditional Chinese music and instruments. Suona, a very expressive reed instrument with a conical metal bell, is very popular in China's vast countryside in funeral, wedding, and other celebrative occasions. Meanwhile, it is also an indispensable part of a number of local operas in Hebei, Shandong, Liaoning, Shandong, Shaanxi, Shanxi, and Guangdong provinces. Pipa, a four-string lute in pear shape, is an instrument that witnesses the cultural communication. The Pipa tunes have very diverse styles, and are traditionally classified as either Wen Qu (civil and mild tone) or Wu Qu (martial and fierce tone). 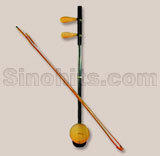 Erhu, a two-stringed fiddle, is one of the best-known traditional Chinese music instruments. Its music is usually very expressive and touching, especially when you feel down and blue. Banhu is mainly an accompanying instrument for various local operas in North China. Its construction is basically the same with Erhu, and the most noticeable difference is that Banhu uses a thick wooden board to cover the soundbox instead of snakeskin. 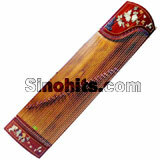 Zheng, or Guzheng is a kind of Chinese zither with movable bridges and 16 - 25 strings. 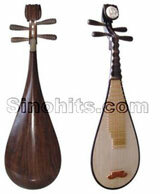 It is one of the best-inherited ancient music instruments, and relatively more popular. What's more, Guzheng has been successfully incorporated in a lot of modern music like Chinese rock'n'roll. 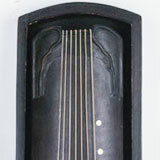 Guqin, literally meaning ancient ancient music instrument, is a seven-stringed zither without bridges. With a history of more than 3,000 years, Guqin music has been enlisted as a Masterpiece of the Oral and Intangible Heritage of Humanity by UNESCO in 2003. Xun, with a history of six to seven thousands years, is an earthen musical instrument, which can be categorized as a kind of ocarina. Its tamber similar to human voice, but emitting a very distant and primitive feeling, thus suitable for performing some lamenting aria.